Limited Edition on 180 Gram Pale Blue Vinyl. Allan Kingdom burst onto people’s radar back in 2015 when Kanye West enlisted him to sing the hook on his stand alone single All Day. Allan’s sound is one that draws from early Kanye and Kid Cudi. Despite the strong features list - Denzel Curry, Kevin Abstract, Cadenza and more. 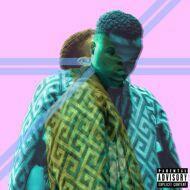 Lines feels like Allan’s project, showcasing his versatility and melodic talents.